The Nicene Creed is the definitive statement of faith for the Body of Christ, the Church. 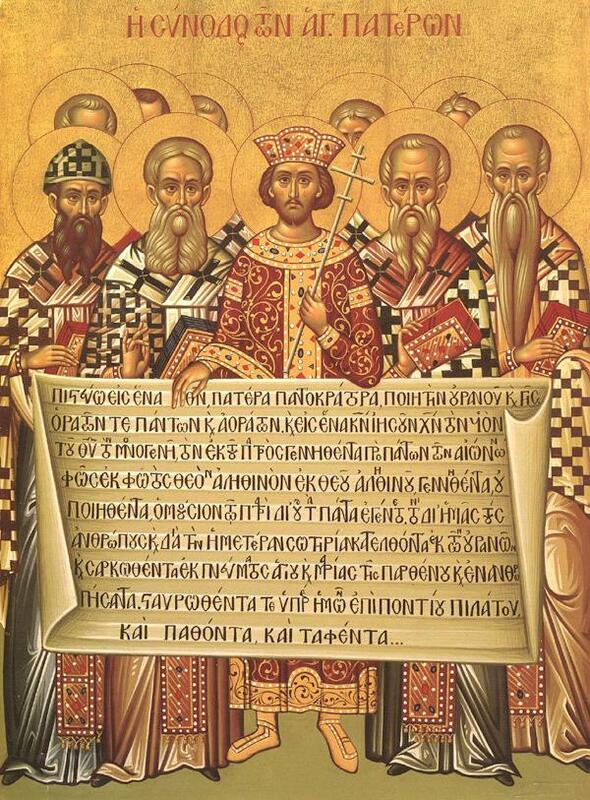 The Nicene Creed was formulated at the First Ecumenical Council at Nicaea in AD 325 to combat Arianism, and it was expanded at the Second Ecumenical Council at Constantinople in AD 381 to balance its coverage of the Trinity by including the Holy Spirit. It is the only creed that was promulgated by any of the seven ecumenical councils and thus it is the only creed that is truly ecumenical and universal. In the Orthodox Church, it is the only creed. The New Testament and the Nicene Creed are deeply entangled with each other. The wording and the concepts in the Nicene Creed come from the New Testament—in fact, one of the most important debates at the Council of Nicaea concerned whether it is proper to include a word in the Nicene Creed that does not occur in the New Testament. On the other hand, at the time that the Church issued the official canon of the New Testament, it customarily compared writings to the Nicene Creed to determine if they were orthodox. To put it more precisely, the Nicene Creed and the canon of the New Testament were formed together as part of the same process. The Nicene Council did not invent the Trinity in the early fourth century, as some people imagine. A full century before the Nicene Council, Tertullian wrote a voluminous explanation and defense of the Trinity. His third-century contemporaries used the Nicene Creed to defend the orthodox Christian faith to unbelievers. A couple of decades before Tertullian, Clement of Alexandria, and Irenaeus, bishops at opposite ends of the Mediterranean basin, both taught the Trinity. A half century or more before Irenaeus and Clement, we find Trinitarian teachings in the authentic works of Justin Martyr, who died in 157. St. Ignatius, a respected bishop, was martyred in his old age. On his way to his martyrdom, he wrote epistles to the churches along the way, making theological statements that are best understood in the context of Trinitarian theology. It is important to note that Ignatius was born about AD 33 and that during his adulthood; people who had known the apostles were still alive. Finally, the Didache, an ancient manual of church discipline that could possibly date from the middle of the first century, quotes the Trinitarian formula of Matthew 28:19 in its instructions for baptism. We can trace the dogma of the Trinity straight back to apostolic times. We have it from the pens of bishops and theologians who were charged with preserving and passing on the faith and who lived all over the Mediterranean basin. From this, we can only conclude that mainstream theology in the ancient church before the Council of Nicaea was Trinitarian. In AD 589, a church council in Toledo, Spain, modified the Nicene Creed so that the Holy Spirit would proceed from the Father and the Son. (In Latin, and the Son is filioque, so this is known as the filioque clause.) There may not have been any particular motive for this change, because it looks like something a scribe would do to mend the text. The possible intention to the change was to strengthen the defense of the Trinity. The filioque clause spread through the western part of the church. In 796, Paulinus of Aquileia defended the filioque clause at the Synod of Friuli, which indicates that it was opposed, and after about 800, it crept into the liturgy in the Frankish Empire. Some Frankish monks used the filioque clause in their monastery in Jerusalem in 807, but eastern monks disputed it as improper. Because the Frankish monks were from the west, the matter was escalated to the bishop of Rome (Pope Leo III). He approved of the sentiment, but he opposed the change in the wording. Leo arranged for the creed in its original form (without the filioque clause) to be engraved on silver tablets and he had them placed at St. Peter’s tomb. After the split between Rome and Constantinople in 1054, the filioque clause became part of the Nicene Creed in the Roman Catholic Church. This happened at the Council of Lyons, in France, in 1274. In 1439, at the Roman Catholic Council of Florence, the Roman Catholic Church invited the Eastern Orthodox Churches and attempted a reunion. There were many issues, some of which seem trivial today, but the most important ones were the papacy and the filioque clause in the Creed, which is our subject here. Orthodox Christians argue from Scripture that the Father sends the Holy Spirit in Jesus’ name (John 14:26). Jesus declares that the Holy Spirit proceeds only from the Father (John 15:26). There is a difference in the biblical words used for “send” and “proceed.” The Greek word “send” in the Gospel of John 14:26, 15:26, and 16:7 means “to bid a thing to be carried to one or to send a thing into another.” The only other word Jesus used for “send” in Luke 24:49 is “apostello” which means “to order one to go to a place appointed.” The Greek word used in John 15:26 “proceeds” means ” to go forth from, go out of, depart out of, to issue from, to flow forth, to proceed from.” The filioque “and the Son” adds to the revelation of Holy Scripture. To say that Scriptural references to the Holy Spirit as the Spirit of Christ validate the filioque clause does not render the correct interpretation and understanding. Everyone at the Second Ecumenical Synod knew well that this question was settled once and for all by the use in the Nicene Creed of the word “procession” as meaning the manner of existence of the Holy Spirit from the Father which constitutes His special individuality. Thus, the Father is unbegotten, i.e., derives His existence from no one. The Son is from the Father by generation. The Holy Spirit is from the Father, not by generation, but by procession (John 15:26). The Father is cause, the Son and the Holy Spirit are caused. The difference between the ones caused is the one is caused by generation, and the other by procession, and not by generation. The Holy Spirit is an individual “hypostasis” with individual characteristics or properties not shared by other “hypostases,” but He does share fully everything the Father and Son have in common, to wit, the Divine essence and all uncreated energies and powers. The Holy Spirit is an individuality Who is not what is common between the Father and the Son but has in common everything the Father and the Son have in common. This, in relation to Jesus Christ, the Word (Logos), the Son of God, is united to His humanity by nature or hypostatically, and the Father generates His Son not by will only, but by nature primarily, the will not being in contradiction to what belongs to God by nature. Thus, God generates the Logos by nature and by will. The Holy Trinity creates and is related to creatures with the exception of the Logos Who by nature unites Himself His own humanity. Therefore, the Logos (Jesus Christ, the Son of God), is uncreated and unchangeable, has always existed from the Father, Who by nature generates the Logos before the ages. Therefore, generation and procession are what distinguish the Son from the Holy Spirit. Since the Son is the only generation begotten Son of God, procession is different from generation. The Church Fathers at the Second Ecumenical Synod spoke in no uncertain terms leaving out the Filioque neither because of ignorance nor by omission, but by Divine inspiration. Orthodox Christians maintain that one part of the Church does not have the authority to change what is the property of the whole Church. Since Canon VII of the Third Ecumenical Council at Ephesus in AD 431 is still in effect, a true Ecumenical Council can only change the Nicene Creed. Roman Catholics believe that the Council of Lyons in 1274 was ecumenical. Whether or not it was ecumenical depends on your view of the jurisdiction of the pope, so that goes back to the issue of the papacy. Some Protestants inherited use of the filioque clause from the Roman Catholic Church. The Church formulated the Nicene Creed before it selected certain apostolic writings, calling them the New Testament, and declared them to be Holy Scripture. Another way of looking at it is that God chose the people who were bound by the Nicene Creed to affirm the contents of the New Testament, thereby endorsing the theology of the Creed. The Nicene Creed is, therefore, a reliable test of our interpretation of the New Testament. If we are at variance with the Nicene Creed, we are in error. Therefore, whoever denies the theology of the Nicene Creed must also deny the theology of the New Testament, and whoever upholds the New Testament, as Holy Scripture must also affirm the theology of the Nicene Creed. In the beginning, the Church did not have a formal creed, nor did it have a formal list of the books in the New Testament. Then it formulated the Nicene Creed to express its doctrines and to serve as a test of orthodox teaching. Therefore, for a while, there was a Church with the Nicene Creed but, even though it used the books of the New Testament as Holy Scripture, it had no official statement saying that they were. After the Church accepted the Nicene Creed, it made a formal list of the books in the New Testament. Therefore, whoever attempts to reconstruct the ancient Church with an official list of New Testament books but without the Nicene Creed is reconstructing an imaginary church that never existed. This doesn’t mean their church is invalid, it just means that it isn’t a historical reconstruction, because, in any part of Church history in which there was an official list of New Testament books, the Nicene Creed was the official expression of faith and the final test of orthodoxy. Traditional liturgical worship always includes the Nicene Creed whenever there is Communion. It is a corporate proclamation that corresponds to the Schema (“Hear, O Israel, the Lord thy God is one”) in the synagogue liturgy.